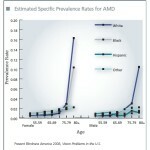 More than 2.1 million Americans age 80 and older have low vision or are blind-- 23.7% of the 80 and older population. Silver BookMore than 2.1 million Americans age 80 and older have low vision or are blind– 23.7% of the 80 and older population. More than 2.1 million Americans age 80 and older have low vision or are blind– 23.7% of the 80 and older population.